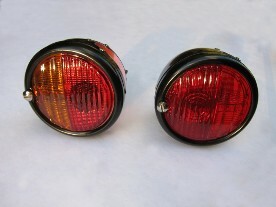 We stock both the original type standard side / brake light with clear side window for illuminating the registration plate and the modern indicator conversion type lamp incorporating a split red/amber lens. We can supply chrome finish by way of special request. All VMGP lamps incorporate a nickel plated Lucas 'King of the Road' medallion. Also in stock are spare 6v and 12v bulbs and the smaller indicator bulbs. Also in stock the Lucas ST38 style pork pie conversion kits for standard lamps.